Nearly 20,000 Views, New Rankings! Proxiblog’s audience keeps growing with close to 20,000 views worldwide in the past year, as bidders register to read about top coin auction houses. Speaking of which, after points were tallied for consignments, photography, lot descriptions, buyers’ fees, customer service, shipping and numismatic knowledge, we were as surprised as you might be in discovering 5 houses tied for highest scores. Listed alphabetically, they are Capitol Coin Auction, Key Date Coins, Silvertowne Auctions, Weaver Signature Coin and Currency Auction, and Western Auction. Note: Regular postings to begin on Sunday, Aug. 5. Beginning next week, we will do spotlight features on each of these houses, noting what makes them so special–including what practices they follow–so that bidders and auctioneers can benefit from our reviews. Making her debut in our top rankings is Debra Johnson of Auctions Unlimited, which has one of the lowest buyer’s fees on Proxibid at 10% and which also dropped transparency notices. Midwest Coins also did likewise, and we’re happy to include this fine Iowa house in our rankings. Braden Auction Service also enters our top houses in the sidebar to the right. While the competition in the Coins and Currency page on Proxibid continued to grow, Proxiblog’s audience also grew in the same five-month time period. Our audience is closing in on 20,000 views. 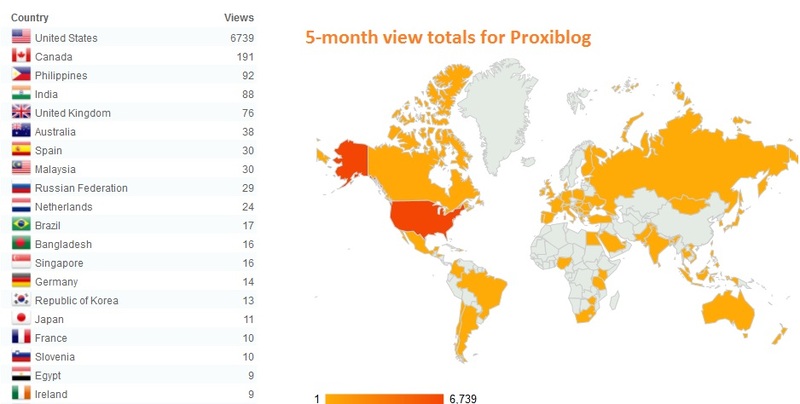 The United States, by far, provided most of that audience; however, Proxiblog’s popularity is growing in Canada, Philippines, India, the United Kingdom and Australia. This entry was posted in Articles, Boos and Booyahs!, Featured Updates, Honor Roll and tagged American Numismatic Association, Auctioneers, Auctions Unlimited, AuctionZip, Best Practices, Braden Auction Services, California gold, Capitol Coin Auction, Click Coins, Coin Auction, Coin Update, dipped coins, Engstrom Auction, GreatCollections, GWS Auctions, iCollector, James Peterson Auction, Kaufman Auction, Key Date Coins, Krause Auctioneering, Leonard Auction, Matthew Bullock Auctioneers, Midwest Coins, National Auctioneer Association, Proxibid, Proxiblog, Scott Auctions, SilverTowne Auctions, This Week in Coins, Weaver Signature Coin and Currency Auction, Western Auction. Bookmark the permalink.